According to the Arthaus keepcase booklet, no fewer than 9 identifiable historical members of Georgiana’s circle are on the stage above together with other guests. The main event for the evening will be for the 9 to perform Handel’s Alcina as amateur music lovers. (Georgiana has hired expert musicians to play the orchestra parts and professional dancers.) This was in fact something that aristocratic people attempted to do in the days before 4K with HDR TVs. The show continues with a typical insanely complicated Baroque opera plot based on numerous improbable intrigues, misunderstandings, and rapid changes in positions and moods. All this is cheerfully offered by Handel and accepted by the audience so as to give the composer the maximum number of arias in which he can treat every variation of love that literature ever dreamed of. Sets, costumes, lighting, dramatic concepts, personal directing, and acting all take a back seat to the avalanche of recitatives and arias. If you don’t like the one you hear now, fear not, another is soon coming! Note also the stage musicians. They represent the small forces that Georgiana was able to round up for her party, and their playing turns out to be quite charming. Now that we have described the opera within the opera, how do we describe the main opera? Well, take all of the above and add a full period-instrument Baroque orchestra in the pit. This is the fine Les Musiciens du Louvre — Grenoble, whose playing is magnificent. Only the audience in the theater can hear the pit orchestra. 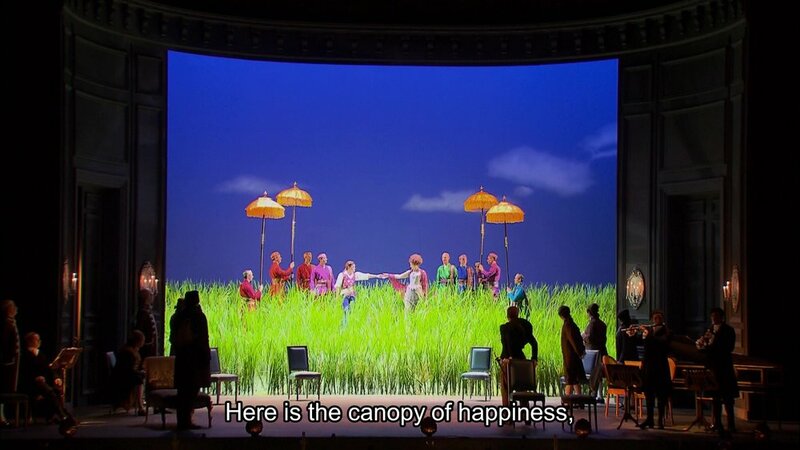 Finally there is also a home theater audience watching (1) the opera within the opera and (2) the opera. We at home are a super-audience — only we get to see the big brilliant subtitles in six languages including Italian. Whew! All the music was well recorded with 96kHz/24-bit sound sampling and fine miking and mixing. Print critics, who usually like traditional productions best, seemed to approve this disc. In 2011 most of them were just getting DVD players to watch on old SD TVs — few of them could afford Blu-ray players and HD TVs. An exception was David Shengold, who reviewed this in Opera News (January 2012, at page 62). He states that "Kasarova offers an incomprehensibly busy and vocally wayward performance that pushes the limits of self-parody" and that "Blu-ray reveals everything in amazing clarity---including Kasarova's . . . distressing facial contortions." Richard Lawrence, writing in Gramophone (December 2011, at page 99) also slams poor Kasarova. 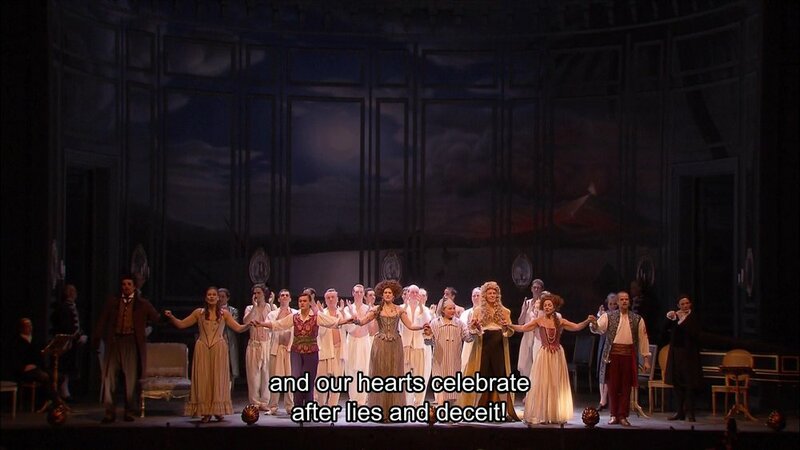 Here are our conclusions formed in early 2019: The instrumentalists are terrific and the singers good enough (especially Harteros) for the average opera fan to enjoy all that Handel offers musically. The sound recording is fine, and the title should get a “+” for the 96kHz/24-bit sound sampling. The keepcase booklet is excellent. From there on it’s downhill. The cast is weakened by using a short woman as Ruggiero. 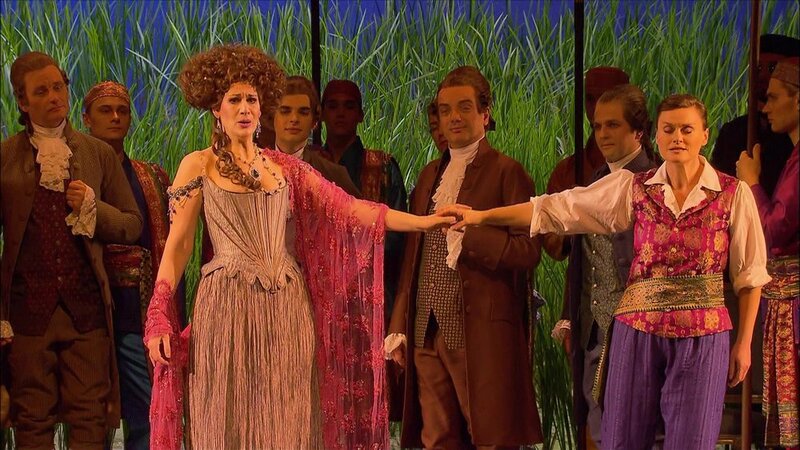 The opera within the opera is clever and appropriate for seasoned opera experts, but it is too complicated and prissy for everybody else. Energy that could have been directed toward the psychological aspects of the story is dissipated on intricate mechanics. The lighting is a complete disaster for the live audience and the HT. The choreography would have been improved by giving the ballet dancers a vacation with pay. The English subtitles are pretty good when they appear, but too often they do not. This was put together early in the era of HDVD, and it now shows it’s age. We give this a C, which we boost to C+ thanks to the 96kHz/24-bit sound sampling, but only for those with the sitzfleisch needed to hack it. We see lots of YT clips of this, all in distressing SD.